The African Chicken Genetic Gains (ACGG) project team held a series of meetings in Nairobi, Kenya, on 4-11 December 2015, to plan the process of data collection for the on-station and on-farm chicken breed trials and to discuss ways of partnering with similar project in Ethiopia, Nigeria and Tanzania. The first workshop that the team attended was a ‘writeshop’ that took place on 7-8 December 2015 that focused on finalizing the on-station/on-farm data collection protocols that will be used in the project based on a draft protocol previously developed by the ACGG team in Ethiopia. ACGG on-station testing will be carried out on a total of 18 chicken strains at two sites in each of the project countries. Additionally, 15 sub-national zones (SNZ), 56 districts, 7,500 low-income smallholder farming households are expected to participate in ACGG’s on-farm testing where at least 24 chicken strains will be evaluated. A producer-level baseline survey has already been completed in the three countries and will be used to appropriately design the chicken performance testing activities that are expected to start in the beginning of 2016. The participants of the writeshop agreed what to collect, how often and and how long that data will be collected. They discussed the road map for data collection and appropriate ways of using that data (and by whom). One of the conclusions of this event is that the data collection mechanism will be primarily tablet-based using the Open Data Kit although paper-based data collection will also be used where there is limited or internet connection. The participants also agreed to keep the data collection process as simple as possible and to let the village-based enumerators manage it. As a result of this writeshop, the data collection protocols are nearly finalized and a final version is expected by the end of 2015. These will be shared with all ACGG national partners at the second program management team meeting in Tanzania in January 2016. Data collection sheets will be also be prepared. The Nairobi meetings also saw the launch of two other projects related to the ACGG. The African Dairy Genetic Gains (ADGG) which is a sister project to ACGG, and the Joint Centre for Livestock Genetics and Health (JCLGH) project which is led by International Livestock Research Institute (ILRI) and the Roslin Institute. As part of the launch, the various program representatives discussed areas of collaboration between the three projects. Some of the opportunities highlighted included getting collaborating in the use of molecular techniques developed by the Roslin Institute for breeding improvement efforts in ACGG and ADGG, sharing chicken tissue and blood samples collected and phenotypic (performance) data from the two genetics improvement projects with the Roslin Institute for further molecular analysis. More areas of collaboration will likely emerge in the future, as this meeting was only one of an upcoming series of interactions between these three genetics-focused projects. Later in the December 2015, another meeting took place in Addis Ababa, Ethiopia, between ACGG and the Improving Nutrition Outcomes Through Optimized Agricultural Investment (ATONU) project to identify areas of cooperation around nutrition in Ethiopia. In October 2015, a meeting between ACGG and ATONU had proposed developing pilot project proposals around identified gaps. 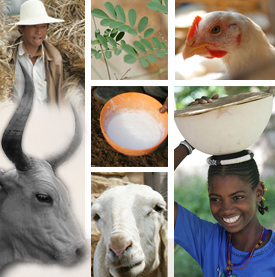 Through functioning public private partnerships targeting at least two operating partnerships per country to ensure that smallholders have access to their preferred breeds that produce at least 200% more eggs and meat than existing local breeds, with significantly reduced mortality risks due to proper brooding and pre-vaccination. Demonstrating and publicizing data showing that the adoption of the proven chicken genotypes indeed leads to significantly increased production, productivity, income, and household consumption among smallholder communities that adopt the technology. Setting up a functioning multi-country network of public-private partnerships for long-term chicken genetic improvement that has both the strategy and capacity to use modern tools to drive accelerated genetic gains and to deliver more productive, farmer-preferred breeds. Tags: African Dairy Genetic Gains, Data collection, ILRI, Roslin Institute. Bookmark the permalink.